A gorgeous crop of shade-grown, Cuban-seed tobacco in mid harvest at Quemado de Rubi, a farm in Pinar del Río run by Hector Luís Prieto. The Chinese-made sedan lurched down a one-lane dirt road, skirting puddles of water and seeking high ground between the deep ruts. The small town of San Luís is a few miles away, as the crow flies, but unlike the trip on the wings of a bird this journey by earth is long and slow. There had already been three stops, each of them to ask someone walking if anyone knew the whereabouts of Sergio Paz’s farm. He was asked about his work. “I don’t really have time to talk,” he said. “I’m the only one who can drive the tractor, and I have to get leaves from a nearby field.” When asked again, he agreed to a short chat. Fifteen minutes, no more. “We are having a great year. Never seen one like this one in recent years,” he said. At the time it was February, and the tobacco harvest was almost done. More questions, more answers, but the farmer began shifting from foot to foot, eager to get back on his tractor, eager to get back to the business of bringing in his crop from the field. The farm of Sergio Paz is considered one of the greatest tobacco producing farms in Cuba. For a cigar smoker, Pinar del Río and the Vuelta Abajo may conjure up images of vast fields of tobacco with bright green leaves moving gently in an afternoon breeze. But in reality, the lands where Cuba’s finest tobacco is grown are quite small. Within about 100 square miles, the areas around two Cuban towns—San Luís and San Juan y Martínez—occupy the heart of the broader tobacco-growing region. Many consider them the finest tobacco lands in the entire world. It is where growers like Paz weave their agronomic magic. The passage of time in Cuba has obscured the names of the great vegas, or farms, where the best tobacco has been grown for more than 150 years. Legendary names like Hoyo de Monterrey, near San Juan y Martínez, and El Corojo, near San Luís aren’t mentioned often today in the same hushed and reverent tones as they were before. It’s even whispered that El Corojo, the birthplace of the Corojo seed long prized by connoisseurs, is unproductive today. Furthermore, no single farm is associated with a cigar brand, as they often used to be before the Cuban Revolution in 1959. The Cuban government reportedly maintains a list of the vegas finas, or Cuba’s best tobacco farms, although they are reluctant to make public that information. But the farmers know which farms are the best, and who is producing the finest tobacco in Cuba. Based on visits during the last five years to the Vuelta Abajo, Cigar Aficionado has come up with a short list of the five top growers and their farms in the region. In some cases, such as Sergio Paz, they are only known by the grower’s name. Others have names akin to, perhaps, a famous dude ranch such as Cuchillas de Barbacoa of Alejandro Robaina fame, or Quemado de Rubi, run by Hector Luís Prieto. There are no scientific criteria for the selection. Two of the farms are well-known worldwide, one has been promoted recently by Habanos S.A. and the other two farms were identified by fellow tobacco growers, off the beaten track and certainly off the usual stops for tourists wanting to experience an authentic Cuban tobacco farm. This report reflects more about the tradition of tobacco in Cuba’s Vuelta Abajo, and not so much about the cigars in which that tobacco ends up. In the old days, factories producing specific brands had formulas for the blends that included place names, or farms which supplied the factory directly with tobacco. But no longer. Today, cigar tobacco, after it has been cured on the farms, is processed and sorted in regional warehouses and then shipped around the country to factories where it is needed. Cohiba, according to some reports, still receives tobacco from a select group of farms; many speculate about which farms supply the bulk of tobacco for Cohiba but there is no officially sanctioned public list. If you are lucky enough to get inside a loading dock or receiving area in a Cuban cigar factory, you may see tobacco bales with codes and even some place names but there’s no guarantee that the factory will get the same mix of tobacco next year or the year after. The farms are not listed in any order of excellence but by location. An intrepid cigar lover could travel this way and see Cuba’s most talented growers, and—in many cases—smoke a cigar rolled from the local leaves, right on the premises. The Robaina family has operated this tobacco farm since 1845, and a fifth generation descendent, Hirochi Robaina, is running it today. The farm is located near the town of San Luís, and is approached through a rutted, red clay road best traveled in a four-wheel SUV. The Cuchillas de Barbacoa emblazoned on one of the curing barn roofs can be seen from the road as you approach. Entry means passing through a rusting green iron gate, under an arch with the name Alejandro Robaina, the former patriarch who passed away in 2010. The road ends in a dusty courtyard. There is a stand of palm trees surrounded by tobacco curing barns, two small houses, one with a museum to Alejandro Robaina, and a large thatched roof pavilion where guests are entertained and fed. Cuchillas de Barbacoa consists of 17 hectares (about 42 acres), and 7.5 hectares (about 18 acres) are dedicated to growing tobacco with an average annual production of 20,000 pounds of tobacco. Half of the production is shade tobacco for wrappers, and half is filler tobacco. The rest of the land is used for growing vegetables and fruits. “We use the same farming techniques that my ancestors did,” Hirochi Robaina says, sitting in a cane-backed wooden chair and smoking a cigar rolled on the premises with tobacco from the farm. The cigars are full-bodied with a wonderful earthy flavor. Hirochi follows in his late grandfather’s footsteps, including a tradition he maintains every September. That’s when Hirochi says his grandfather used to sit on the front porch and wait for a north wind that heralded the end of the hurricane season; if it came, it was time to get ready to plant. The highway to San Juan y Martínez makes a slow curve to the left, and a dirt lane cuts up to the left between two rows of royal palm trees. Ivan Maximo Perez, known simply as “Maximo,” is the third generation running the six hectare (15 acre) farm, five of shade tobacco and one of sun-grown. Between 10 and 12 workers share the workload with him. “My grandfather and my father passed on the knowledge about the climate and the farm here,” Maximo says, “and now that is linked with science for the changing climate.” Maximo has shifted almost entirely to organic fertilizers, without the use of fungicides and only 30 percent of insecticides he used to apply to the fields. “We had to find alternatives in the early ’90s when we didn’t have chemicals or even gasoline,” Maximo says. Maximo says that he has improved the soil every year over the last 10 years; one method of improvement is by planting a type of bean in the off-season to put more organic material in the soil. Maximo has been using seeds recommended by the Tobacco Institute, and his field has been a testing ground for new hybrids. “I really like Criollo 2010,” he says, partly because it retains the flavor profile of Cuba’s black tobacco. He also uses Corojo 2012 in both his shade- and sun-grown areas. This farm usually yields about 15 tons of tobacco every year, which is then processed in three curing barns on the property. This location has also become one of the official stops on the cigar tourism tours. There is a new pavilion about the size of a basketball court, with chairs and tables and a wooden bar. “Would you like a cigar?” Maximo asks, as he opens up a wooden box on the table in front of us. “This one has a filler tobacco from 2014 and wrapper from the 2016-2017 crop. I rolled it myself.” It was a beautiful smoke. 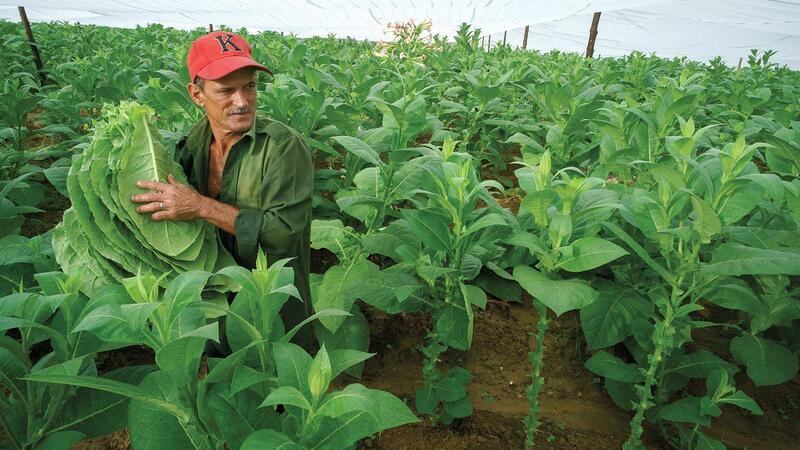 The next stop, about two miles from the main highway, near a bend in the Río Feo, is the farm of Hector Luís Prieto, arguably the most famous Cuban tobacco grower today after Robaina. His family has tilled the farm for 100 years. “We had always maintained the same traditions,” says Prieto. “We use some new varieties of tobacco, but the tradition, the way we plant, the way we harvest are all the same.” The farm’s planting was expanded in 2017-2018 to 10 hectares (24 acres), with 300,000 plants in the ground; the previous year he had planted only about 200,000—60 percent of them under shade and the rest sun-grown. Prieto has a full-time roller who prepares cigars for his visitors, in a two-story thatched roof pavilion with an attached guest room. The cigars are full-bodied, with beautiful reddish-brown or colorado wrappers. Prieto believes the new hybrids they are using are every bit as good as the older varieties, and “they have a great flavor.” He planted Corojo 2012 last year, which is a cross with Habano ’92, one of the original hybrids created in the early ’90s. On this farm, the plantings are differentiated by geography. Prieto plants his shade tobacco on higher ground, about 100 yards above the river that rolls slowly through his land, and sun-grown next to the river. “It is soil that is perfect for shade tobacco,” Prieto, a former Habanos Man of the Year for production, says as he looks upon his fields. The farm sits up on a rise with a view of the buildings in San Juan y Martínez, located only two miles away. This is the land tilled by Gerardo Medina Relova, and he has 12 hectares (30 acres) of tobacco growing here. Half of it is sun-grown, planted around his homestead and the other half is shade, grown at a nearby location. Like the other top farms in Cuba, Medina’s sits at the end of a tiny dirt road that passes small one-room huts and small non-tobacco fields. This farm is the smallest of the big five, with only 4.5 hectares of shade under cultivation and less than a hectare of sun-grown. “I have 140,000 plants under shade, and 30,000 in the sun,” says Sergio Paz Cordoves. Fifteen to 20 people work here. Paz’s family has worked this land since the 1940s. He took over after his father, Antonio María Paz Valladares, died in 2016. Lin Paz, as he was known, was considered by his peers to be a tobacco magician on the same level as the much more famous Alejandro Robaina. Paz began working here 23 years ago, when his father couldn’t work anymore. “I studied at his feet and learned everything he had to teach me,” Paz says. He learned many secrets from his father, from preparation of the land, to managing a tobacco barn in dry or humid conditions, and when the tobacco was ready to be picked. “It was like getting a master’s degree in tobacco from my father,” he says.